Mail a mystery, to anyone, anywhere the mail goes! Include your own secret message trapped within, revealed by solving the game. This is no easy task! A peculiar envelope arrives in the mail, personally addressed. 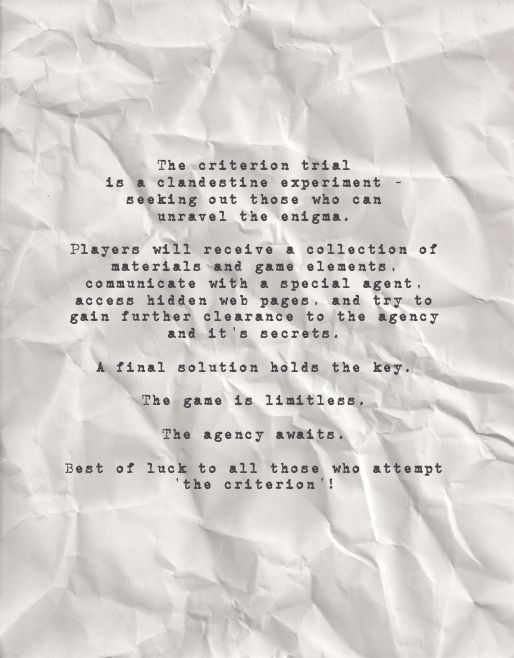 Opening it reveals strange elements, items, leads, ciphers, and conundrums – the game has begun. Players use the clues in the mail, hidden web pages, (free) apps & online resources, and common household items to unlock the secrets, and crack the codes. The adventure is limitless. Who can solve the game? Mystery Mail does not appear as a packaged ‘board game’, but rather an envelope of odd yet unassuming bits and pieces that, in the right hands and with a little guidance from the game, will unravel an enigma and launch players into an immersive world of intrigue – from the comfort of their couch. 1, Order the game for your family, friends, yourself, whoever – select an optional delayed start date, include an optional personalized message revealed when the game is completed. 2, We will confirm your order, you can access a printable gift card to provide to the recipient and give them a heads up about the game, or don’t and leave it part of the mystery. If players don’t solve the game…? Players will be provided all of the materials required to complete the game at their convenience. Hints are available. If players do solve the game…? A final secret message will be revealed along with the identity of the sender and their secret message (if included). You can add more to the fun of Mystery Mail by getting creative and using our secret message option to reveal something special: provide a hidden location or lock combination to a gift, include a web address or password to an image or video card you’ve made (IMPORTANT: do NOT include anything of vital importance or with personal security concerns – not all players solve the game). Ask away! Chat with us on Mystery Mail’s facebook, or use the email messenger below (but, we won’t give away any secrets about the game).